and PocketChange will try to ensure that you always carry precisely those amounts. It checks your currency levels whenever you talk to the banker and either deposits what you have that is over the limits you set, or it withdraws enough to bring you up to those levels (presuming you have enough in the bank to do so - it won't manufacture money for you, sadly). PocketChange does not manage Transmute Crystals because they are only kept in the bank - never on a particular character. For supplies, it does not deposit to or withdraw from your bank. PocketChange just lets you know that you might want to fill up your supplies if they have gotten low. You can have it ignore the item, post a message in chat, or post a message in chat and make the alert sound. When set to do so, it will list the item, the total number that you have in your pack, and the minimum number that you set in the options. In the case of the poisons, it will list the total number that you have equipped instead of the number that you have in your pack - because you cannot use poisons from your pack until you first equip them. 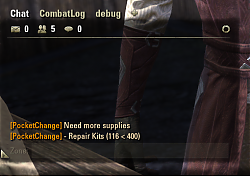 Note: PocketChange does not look at the levels of repair kits or soul gems you have. It will count Commons with Grands and Crowns and so on to come up with a total number. Use the chatter messaging from LibSFUtils instead of reimplementing them. Removed direct dependency on library LibStub. Change to use standalone libraries (LibSFUtils, and LibAddonMenu) instead of bundling the libraries with PocketChange. Upgrade libSFutils to version 13. Used the saved variables functions provided in libSFutils instead of reimplementing them over and over. Add a setting to turn off automatic depositing and withdrawing of gold to the bank as requested by ZoLatKam. Also provide settings to turn off automatic depositing and withrawing of the other currencies to the bank as well. Change to Saved Variables file requiring settings to be reset. Sorry. Upgraded LibSFUtils to version 8. Upgraded LibSFUtils to version 7. Upgraded LibSFUtils to version 6. Added the ability to monitor how many poisons you want to have equipped (at a minimum) for both the main weapon and the backup weapon poison slots. Added a monitor for empty soul gems by request. Fixed errors with having per-character settings. Now when you turn off the "Apply these settings account-wide", any further changes that you make to the settings will be saved specifically for the character you are playing. Turning "Apply these settings account-wide" back to ON will convert back to the account-wide settings. Fixed the error with initializing saved variables to a default that includes subtables. It will now properly set default values for new variables that were added to the subtables without affecting the previously known settings. Fixed an error counting lockpicks in the backpack. Initial currency management version for beta. Hello, can you add not locked equipments ? That would help for deconstruct. That is not what PocketChange was designed or intended to do. Re: Re: Option to disable the gold pull/drop feature? Is it possible to disable the automatic gold withdraw/deposit feature of this mod, perhaps by commenting out a line in the code? I ask because I'm having an issue with another mod that has a "gold pull/drop" feature because both PocketChange & this other mod are conflicting with auto-withdrawing/depositing. Explanation: Both mods are attempting to run simultaneously because neither have the ability to fully disable the gold pull/drop feature & I've, unfortunately had to disable PocketChange because of it. Released today in version 1.8. Fantastic! Many thanks for the quick response! The new options are fantastic! Re: Option to disable the gold pull/drop feature? Option to disable the gold pull/drop feature? Last edited by ZoLatKam : 10/19/18 at 02:50 AM. Interestingly enough, PocketChange will deposit or withdraw money from the bank according to your settings if you open up one of your storage chests. Not any more. ESO fixed the bug that allowed that. Last edited by Shadowfen : 06/23/18 at 03:01 PM. To follow up on previous request below, would it be possible to add chat message on EmptySoulGems? Added in the new update. Can you add per-character setting in one window (eg drop-down character list or something)? Can add automatic withdraw&deposit for EmptySoulGems, FullSoulGems, Lockpicks? I had originally intended to do automatic deposit and withrawal for lockpicks, repair kits, etc. but found out that it is really hard to do. So, while it might come sometime in the future - for now I recommend that if you need to have auto-deposit and withdrawal of items then you should check out Bank Manager Revived. Last edited by lokicoon : 11/23/17 at 11:14 PM. Glad to see someone wrote an addon that deposits and withdrawals gold based on balance. I have noticed one small problem: In the lockpicks chat message: lockpicks 2<10, I have 10+ lockpicks in my backpack. Small problem, but I thought you would want to be aware of it. I've released a new version that I believe fixes the problem. If you still see it, please let me know. Just wanted to let you know that it is now working. Thanks. I will look into that. nice one! thanks for the mention! I learn addon-writing by studying addons that I admire. Seems only fair to acknowledge them.